Over eight seasons, the hit HBO comedy series Entourage followed hot young actor Vincent Chase, his three buddies (Eric, Drama, and Turtle) and his super-agent Ari along their journey through modern-day Hollywood. From star-making dream roles to career-busting fiascos, the boys from Queens were always there for their buddy Vince, while at the same time trying to make a name for themselves. From creator/executive producer Doug Ellin - and based loosely on his and executive producer Mark Wahlberg's experiences - Entourage chronicles the highs and lows of life in the show biz fast lane, as well as the perilous pursuit of fame, fortune and artistic fulfillment. 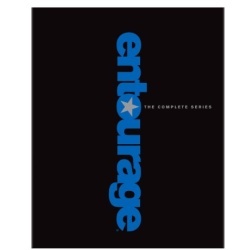 All in all, Entourage is a non-stop hilarious thrill ride that could only happen in Hollywood. Starring Adrian Grenier, Kevin Connolly, Kevin Dillon, Jerry Ferrara and three-time Emmy winner Jeremy Piven.